A Favorite Food at the Rat Refuge and Fish Refuge! This chlorella is in tablet form. Chlorella is a green algae, and an incredible source of full-spectrum, non-toxic, absorbable nutrients and compounds. Chlorella Manna™ is 100% pure broken cell wall chlorella (Chlorella vulgaris). Our chlorella is grown by TruGanic™ (beyond organic) standards in indoor tanks filled with purified water in a carefully sterilized and controlled system from start to finish, resulting in a product free from heavy metals, pesticides, microbes, and other pollutants (such as chemtrails and radiation). 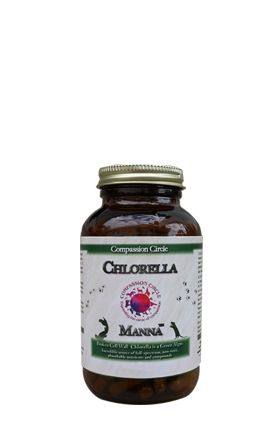 Chlorella Manna™ is carefully dried at low temperatures to retain life force, enzymes, and other heat-sensitive elements. Suggested Use: For rats and other small rodents: Can be used as treats, served in a small dish, or mixed with other dry foods. As with any natural whole food, only serve a small quantity at a time, as exposure to sunlight will degrade the nutritional content over time. For koi and large goldfish: Approximately one handful per 10 fish, or however much they can consume in about five minutes. Koi and goldfish have teeth so will chew them and not just swallow whole. For other types of fish, check with your vet to be sure they can chew. For smaller goldfish or baby koi, we recommend our chlorella powder instead; also hugely beneficial for cats and dogs. Chlorella Manna™ is great for human animals, too! All of our products are the highest quality human grade; we never skimp on our beloved animal family members. *These statements have not been evaluated by the Food and Drug Administration. This product is not designed to diagnose, treat, cure, or prevent any disease.